Nurses play critical roles in perinatal-neonatal care at all levels of the health system: from being skilled attendants at birth, to treating sick neonates; from counseling mothers about breastfeeding to advising home care of a low birth weight baby; and from helping mother of a low birth weight neonate in Kangaroo Mother Care, to transporting a preterm newborn. Global initiative calls for promoting institutional deliveries and care of the small and sick neonates at small hospitals. Most of hospitals will be operationalized for round-the-clock delivery of services by ensuring continuous nursing coverage hence nurses need to be aware about knowledge and practice of essential newborn care. 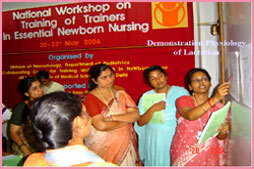 However, newborn component and training is extremely weak in the pre-service programs at nursing schools in India. As a result, an overwhelming majority of nurses recruited for the above mentioned Government facilities are not in a position to provide optimum newborn care. 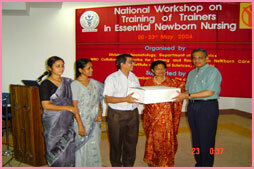 Furthermore, the existing in-service programs for nurses do not address optimally the training needs in newborn care. 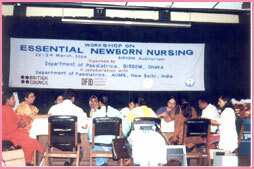 Besides, there is a general paucity of good training materials on essential newborn nursing. This initiative aims at addressing these problems. AIIMS have developed a training module on Essential Newborn Nursing through a detailed process of consultation, revision, and pre-testing. Each year, of the 26 million infant born in India, 1.2 million do not survive to complete the first four weeks of life. Many countries in the region have a high neonatal mortality rate, among the highest in the world. India contributes 30 percent of the global burden of 4 million deaths, highest for any nation. One of the major reasons for the stagnant infant mortality in recent years is the fact that we have not made adequate progress in neonatal survival. A high and static neonatal mortality is a major child health challenge facing our country. Nurses play a critical role in providing newborn care at district and sub-district facilities. They, and not the physicians, conduct newborn deliveries at these facilities. They also provide care to sick neonates brought from the community. Nurses are the interface with the community and the family in regard to the promotion of healthy newborn care practices. Nurses perform critical newborn care procedures and look after the neonatal equipment. It is not an overstatement to argue that nurses form the backbone of newborn care at DHs, FRUs, CHCs and PHCs, and play a more important role than the physicians. Although the national/ provincial Governments have taken major initiatives in providing neonatal care training to physicians & health workers working at small hospitals in recent years, practically no steps have been taken to train the nurses working at these facilities. In a recent global review on resource materials on newborn health supported by Saving Newborn Lives (SNL), it was noted that there is a paucity of suitable training materials on newborn nursing (Dhaka HNP meeting 2003). 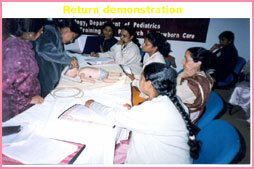 The newborn care curriculum in the pre-service training course of the nurses is often scanty, archaic and theoretical. Hence, if in-service training is not provided, the nurses will not in a position to discharge the expected responsibilities in the priority area of newborn health. 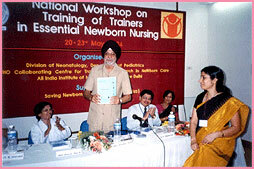 There is no structured in-service training program in newborn care for nurses in the country. Some individuals and academic institutions have, from time to time, been conducting continuing education of nurses. 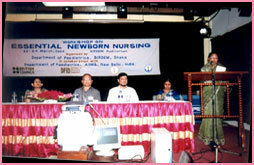 The National Neonatology Forum of India also has been in organizing nursing workshops at the time of annual conventions. 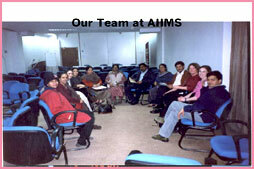 However, most of these programs are directed to nurses of the tertiary care nurseries. The needs of the government sector nurses working at facilities in the small hospitals have not been addressed systematically. It is in this background that AIIMS took lead in developing a high quality training module on essential newborn nursing for nurses working at small hospitals.